Reply, 'Dr John Stewart C[oncerning] a Lady'. Her case is 'very desperate': the physician who told her that her husband had not infected her with the pox was wrong. Cullen is convinced 'she now labours under a Venereal Phthisis'. He advises the use of mercury, even though it may 'hurry on' the Phthisis Pulmonalis fatally. 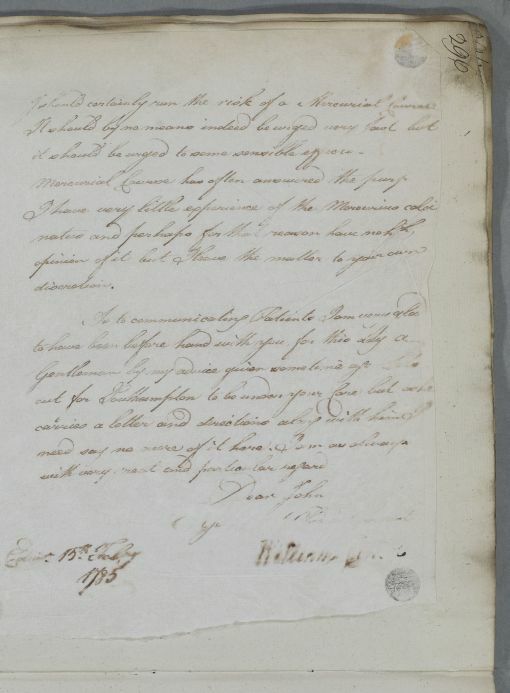 He also tells Dr Stewart that 'this day a Gentleman by my advice given some time ago sets out for Southampton to be under your care', carrying a letter and directions – a reference to James Abernethie of Mayen. Summary Reply, 'Dr John Stewart C[oncerning] a Lady'. Her case is 'very desperate': the physician who told her that her husband had not infected her with the pox was wrong. Cullen is convinced 'she now labours under a Venereal Phthisis'. He advises the use of mercury, even though it may 'hurry on' the Phthisis Pulmonalis fatally. 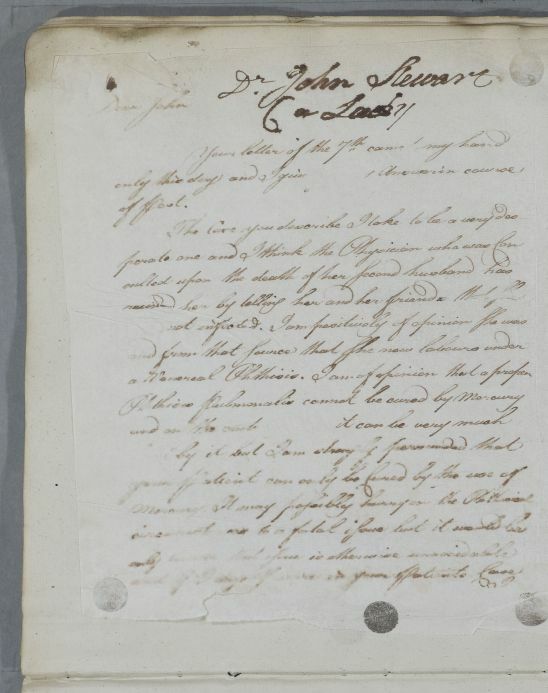 He also tells Dr Stewart that 'this day a Gentleman by my advice given some time ago sets out for Southampton to be under your care', carrying a letter and directions – a reference to James Abernethie of Mayen. Case of Mr James Abernethie who is consumptive. Case of an unnamed female patient with a bad cough. Despite showing no signs of venereal infection she once gave birth to a child who the attending physician called 'one of the worst venereal cases in Children that ever had come under his care'.